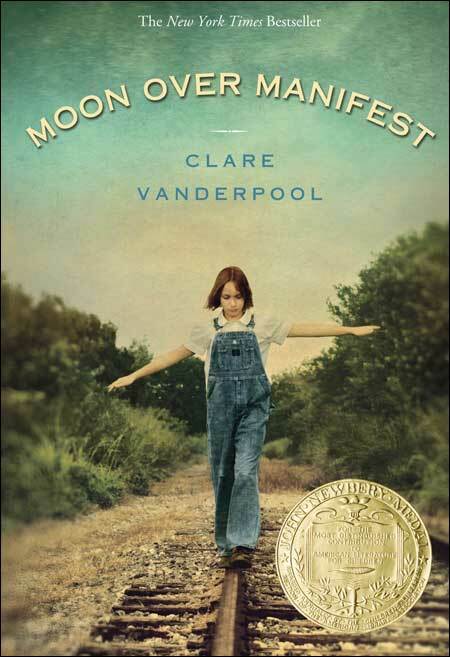 Set during the Great Depression, Moon Over Manifest is the story a plucky young girl named Abilene who is spending the summer in her father's hometown while he works his new railroad job.Having heard stories about Manifest, Kansas all her life, she's a bit disappointed at first by what she sees. Manifest looks like just another 'dried-up, worn-out' old town. But that disappointment quickly fades when she discovers some mysterious old letters about a spy known as the Rattler. With the help of her two new girl friends, Abilene is off on an honest-to-goodness spy hunt, and will soon discover that this old town of Manifest is a lot more interesting than she first thought! Vanderpool weaves such a compelling mystery into this historical fiction novel that we literally could not put it down. Alternating storylines ensure that just as you're really getting into one storyline, the chapter ends and a different storyline picks up. The resulting suspense is delicious! Booklist rightly said reading this book is "like sucking on a butterscotch. Smooth and sweet." And School Library Journal said, "History and fiction marry beautifully in this lively novel...a definite winner." This book won numerous awards including the Newbery Medal in 2011 and was picked as an American Library Association Notable Children's Book. Teachers will love how packed this historical fiction book is with details about early 20th century America (ie: the Great Depression, WW1, the labor movement, prohibition...) Readers get a real sense of the era through the lives of these compelling characters. On her website, author Clare Vanderpool includes some resources for using this book in the classroom. To access these resources (listed below), click here.